Although a few murals are still works in progress, most of them in Plaza Alley are complete. If you haven’t been down to see them yet, you’re in for a treat when you do. For a week in mid-March Ajo hosted the first Community Arts Gathering which brought artists from near and far to participate in this Street Art Happening. Many thanks to Mike (DaWolf) Baker, the driving force who organized the amazing performance by these talented and energetic street artists — professionals and novices alike. And many thanks to ISDA for allowing them the space to create. It’s a wonderful example of what can happen when communities work together. This might just be the start of something big! The street art will continue over the coming days. If you haven’t had an up-close-and-personal look yet, you’re missing out on a great adventure. Do drop by. This amazing gallery of street art is part of the Community Arts Gathering which wraps up today. The Gathering was a wonderful event filled with ideas, energy and talent provided by locals as well as artists from other parts of the state and the country. Many of us don’t get to see artists at work very often, if at all. If you live in or visit Ajo, however, you’ll soon have many opportunities to see artists creating new pieces — right on the street. Mike Baker, also known as DaWolf and Lonewolf, is currently painting a large mural along Highway 85, just south of the Plaza and directly across the street from 100 Estrella Restaurant. DaWolf’s work is familiar to many in Ajo — one of his most recent pieces of street art features a lush tropical scene with a gorilla peering out from the vegetation. Right now he’s developing a piece to promote the Street Art Happening that will be a cornerstone of the upcoming Community Arts Gathering March 14-18, 2015. Street artists will convene on Ajo during this event to paint their own murals along the alley and around the big building on the south side of the Plaza. It will be an amazing undertaking. Creating large pieces like this is a lengthy undertaking — pressure washing the walls, applying a base coat, sketching in the design and then, finally, beginning to paint. If you have the time, it’s definitely worth a visit. Grab a coffee or a pastry at the Oasis Cafe and wander over for a firsthand look. Ajo is hosting its first-ever Community Arts Gathering March 14 to 18, 2015. Many of the participating artists are coming from out of town and will need places to stay. 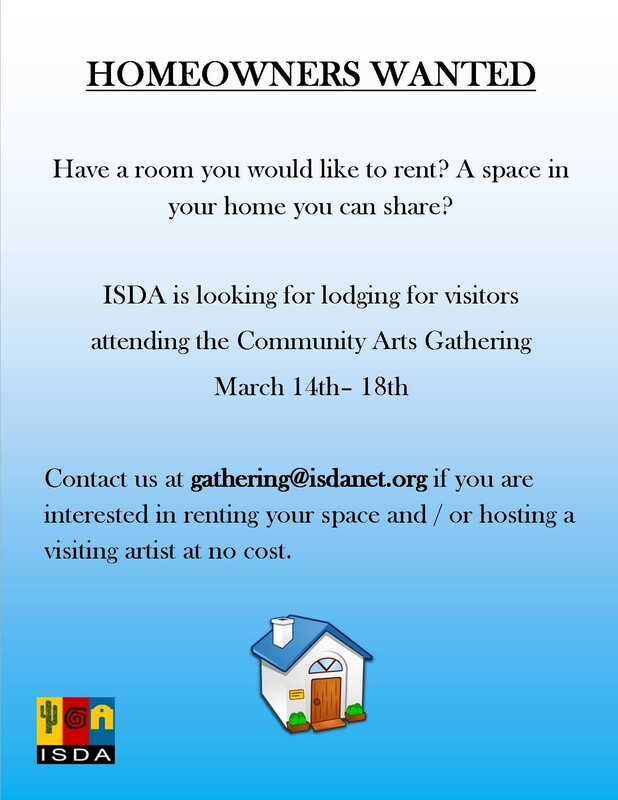 If you have space in your home — or a place to rent for the Gathering — please contact ISDA (International Sonoran Desert Alliance) via the email address in the poster below. If you’re interested in attending the event, registration is now open. Registration is now open for the first Community Arts Gathering being held in Ajo, AZ March 14 to 18, 2015. The Community Arts Gathering is a coming together of artists diverse in culture, discipline, and practice, held at the intersection of three nations — the U.S., the Tohono O’odham Nation, and Mexico. Artists will occupy this unique place in the Sonoran Desert as a framework for a larger national and international dialogue on socially engaged practice and community based arts. This is an opportunity for renewal, connection, sharing, and inspiration between artists working within community. The Community Arts Gathering will offer five days of exciting performances, presentations, workshops and exhibitions of work by community artists from around the country and Mexico. You can register online here COMMUNITY ARTS GATHERING March 14-18, 2015 | International Sonoran Desert Alliance. You’ll also find information on participating artists, schedule of events and places to stay. We hope you can join us for this very special event!